In that post, I was trying to work through the intensity of my own reaction to the episode of Who Do You Think You Are where Rob Lowe discovered that his 5th great grandfather was a Hessian soldier at the Battle of Trenton on Christmas Day 1776 … the same battle where my 4th great granduncle Richard Baker was killed. I couldn’t believe the intensity of my own reaction to something that had happened, what, 236 years ago. And then I was bowled over by the reader response. Since many folks subscribe by e-mail and haven’t seen the comments, please let me share a few with you. And if you have a moment, stop back by the blog later and read them all here. The comments are that good. (W)hat I’ve found most fascinating … is … your emotional journey watching the Rob Lowe episode of WDYTYA and how i(t) brought up emotions for you regarding your ancestor. … It was amazing that you had emotions as if your ancestor was sitting on the couch right beside you watching that particular story together. And you felt every emotion that that ancestor’s crumbs of a legacy left behind for you to get to know their story with your heart, mind, and soul of what those experiences must have felt like. … I was moved by the fact that right now you would stand up for your ancestor and emotionally defend their value for their important life. Those that do genealogy care very deeply for our ancestors (good, bad, indifferent, or whatever description you want to tag to them). Female patriots are particularly amazing. My grandmother’s 1896 proof doesn’t quite stand up to today’s DAR standards, I dunno why, but my 6th great-grandmother, Kerenhappuch Norman Turner, was a heroine and even has a statue in her honor. (My blog at http://jglookups.blogspot.com tells some of her story) She nursed soldiers after the Battle of Guilford Courthouse, including saving the life of her grandson. It took him a year to heal, and his children were born after that. I’m sure there were a lot of brave women nursing the wounded, whether their stories have come down to us or not. (M)y 4x great grandfather, Col. William Montgomery, was a member of the 6th Virginia Regiment. His pension application states, “He was in engagements at Trenton and Princeton, was at Saratoga at the taking of Burgoyne, and had a hard engagement at the White Marsh”. Another 4x great grandfather, Abraham Estes, was also a soldier in the Revolutionary War. I am so proud of my ancestors, and in doing family research, I’ve been surprised to realize a new love and respect for my family members from so long ago. It’s a connection I can’t explain, but it is oh so real. Some readers generously took the time to educate us all on the eligibility requirements to be considered a Patriot for purposes of a descendant’s membership in the Daughters or Sons of the American Revolution, including those from foreign forces that supported the American side such as Lafayette’s troops. Actually, the DAR does recognize the “allies” as qualifying ancestors for membership and the Society actually has a chapter in Paris that consists of both French nationals and Americans living overseas. My understanding is that for the DAR you only need to prove direct lineal descent from a person who supported the Revolution – e.g. was sympathetic to the cause. That doesn’t imply that a person who supported the cause financially was equal to one who fought as a soldier, just that descendants of both were on the “right side” of the conflict. More than a few people shared my disquiet over the decision to recognize Lowe’s ancestor John Chrisopher East — the former Johann Christoph Oeste — as a Patriot by DAR and SAR. I have long struggled with DAR membership because one of my ancestors who demonstrated Loyalist beliefs and abruptly left South Carolina is enrolled in the DAR based on possible participation in the Chickamauga Wars. I am, to say the least, not comfortable claiming him as a Revolutionary War Patriot. It does seem that those who literally bore, raised and fired arms against Washington’s army ought not be considered Patriots. At least not to the United States. I was left wondering how on earth this Hessian soldier could so easily be “transformed” into an American patriot. The explanation was vague and I am offended by the ending. My ancestor fought in the revolution. … I do not belong to the DAR, and after seeing this story, I’m not sure I would want to. I understand that Rob Lowe’s ancestor came to fight in a land he probably knew close to nothing about out of economic necessity (as a landless youngest son) and chose to stay because there was nothing for him economically back in Germany. Here, there was land available to almost anyone. He probably made a decision based at least partly on economics, and also probably became a proud American at some point. However, I think there were a few years between those points, and going from Hessian mercenary to paying a tax within a few years, does not make one a Patriot (with a capital ‘P’). A lot of people took issues with the DAR-SAR rules. I AM a member of the DAR. I chose to become a member mainly because it was a dream of my Mom’s to be a member, and I felt it was something valuable we could do together. … What’s more, currently, the DAR does so much good work to support our troops, and for that alone I’m happy to be a member. However, … (i)t seems unconscionable that someone would even attempt to imply that paying a tax equals blood shed for our liberties. I certainly can’t change the manner in which members were accepted prior to my joining the DAR. Do I wish their membership criteria were different? Indeed I do. I may have paid my last dues to DAR as a result of that insulting move on their part to equate fighting against our revolution and then paying taxes with the six years of sacrifice made by my grandfather who served with Washington. I was also struck by the apparent ease with which the DAR, and then the SAR, would have accepted Mr. Lowe’s ancestor as qualifying him for membership – and without an application or apparent sponsor, no less. Payment of ‘taxes,’ in an area and at a time where non-payment owuld likely have severe consequences, seems a rather thin basis on which to base member and demeans the servies of those with ‘real’ military service. I would also like to comment about the “donating of supplies” (as a qualifying action). Those supplies were frequently collected by ARMED men. How many people would have refused to “give” supplies under those circumstances? I understand the rational of including serving as a juror, justice and in other civil offices, as well as providing supplies, as there is an implicit acknowledgment of the legitimacy of the “revolting” government, but it also bothers me when no effort is apparently made to dig a little deeper to determine if there was a larger “truth”. If only military support qualified, then that would pretty much exclude a descendant qualifying on the basis of a female patriot. What seems more inappropriate to me is that you cannot qualify for DAR based on the blood with which your family paid – the service of your uncle who gave his dear young life for the cause. If one of your grandfathers/grandmothers hadn’t also provided military or patriotic service, you couldn’t join, despite the payment in blood. Yet, Rob Lowe could. Assuming that your uncle had no children, he can’t be a qualified DAR patriot. In my (humble?) opinion, that’s where the real problem lies. You should be able to honor your uncle’s and your family’s sacrifice by qualifying for membership through him. Others defended the DAR-SAR, even if not the position taken on Lowe’s ancestor. I am a recently inducted member in the Sons of the American Revolution. … I wanted to join because it was a source of pride for my family. Not because I had joined but because I had a family member who championed all the ideals I feel so strongly about. … For me, it serves as a reminder of the sacrifices made by my ancestor. It also serves as a reminder for my kids and their kids that they ought to be respectful of the past achievements and hard work of their ancestors. Likewise, it promotes the continuance of some of the greatest ideals ever conceived by one nation. What we know as the American Revolution was a very unpleasant, very personal civil war. Up-close accounts like 1776 show how improbable the actual outcome was. The “smart money” was on the British Empire. If that much is accurate, then I can understand how a lineage society might choose to honor anyone who took any kind of stance in favor of such an underdog cause. This country’s forefathers saw revolt as a last resort solution. They were deeply conflicted by the decision as well as they should’ve been as evidenced in their letters to each other on the matter. Many fought and died for what they believed in, but there are others who had other reasons to fight just as there are today in modern wars. Without some firsthand evidence of how our ancestors felt and believed, we’re left with making conclusions based on evidence and circumstantial evidence. (So) why (join DAR) in the first place? Just a personal preference. My family tree is what it is regardless of a lineage society membership. Oh, and to be contrary, I’m going to do my DAR application at the same time I do my United Empire Loyalists application. It’s who I am. Literally. Wow. As I said, I was bowled over. Completely bowled over. Well I’ll stay out of the rest of the fray—but wanted to add this segment made me look at how many Rev. War ancestors I have. At least 7! And guess what a couple of weeks ago I downloaded the pension file for one but hadn’t had a chance to read it. 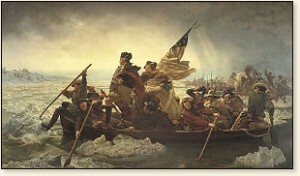 He mentions being there for the crossing of the Delaware but was not engaged in active combat. However he was involved with the guarding of the prisoners! So that was something I didn’t know that tied my ancestor to the whole story! Small world never ceases to amaze. I have Civil War veterans that served for the Union and the Confederacy. And I reckon I had Slave owners and perhaps a slave accounts for my 2 African DNA segments so while I understand nerves I will not sit in judgement as I was not there and do not know the individual circumstances. In some respects, I envy you your ability to remain dispassionate. Part of what I was (and am) struggling with is the strength of my own passionate response to the story. I would not want to be wholly dispassionate, but balance is a good thing! I want to comment on so many things I don’t know where to start. The fact that some people want to make an elitist organization more elitist or how some genealogists get so worked up over people they never knew and are long dead or how TV can make you have visceral emotions. In part I do get some of this. I have the same reaction with 9-11. That day feels very different if you lost a loved one than if you just marked it as a historical moment. I’ve seen genealogical bloggers do this –“I remember just where I was that day, blah, blah, blah.” As if. So, I get your feeling. Whether those feelings are healthy or not is another blog posting. And I think losing someone you knew is much different that acknowledging an ancestral uncle you never knew. Then the entire DAR angle. I think that the exceptions for helping the army was made for Quakers who couldn’t fight and so their descendants could join. But let’s still recognize that this is an elitist organization that discriminates against people descended from groups who immigrated after the American Revolution. Only in the U.S. do we have such lineage societies of all shapes and sizes (there is no French Storming of the Bastille society for instance). I joined the SAR to have my ancestor (who was not in) recognized and my research saved. I promptly let my membership lapse. I’ve done the same with several other societies. If the DAR is too lax you can try for the Order of the Cincinnati (although I’m thinking that it’s male only) and of course, if you want to out-patriot someone, find a signer of the Declaration of Independence in your family tree. There’s the dernier mot! Doesn’t this just get to be my ancestors are better than your ancestors? It seems so. We make up the stories with very little evidence. And we tend to fill in the gaps positively whether or not we should. In any case, it is an extremely interesting discussion. What out for opionating yourself on your blog. I did that and no longer blog because of it and the hostility it started. I’m not quite sure who the “we” was supposed to be in the title of the previous post. Were you trying to say that *you* paid in blood because someone with whom you share 1/64 of your genes fought in the Revolutionary War? I’m with Martin on this one. Despite your repeated assertions to the contrary, that title and your comments strongly imply one-upsmanship on your part. You’re better than Rob Lowe because 235 years ago *your* ancestor picked up a rifle for the “Patriots” and his didn’t. *You* deserve to be in the DAR/SAR, and he doesn’t (even though you adamantly deny an interest in joining the organization). But you are right about one thing – it’s all about emotions, not logic. Congratulations, you win the Victimization Olympics, at least for today. And emotion is exactly what drives the use of phrases like “Victimization Olympics”, no? Google the term and you’ll find you’re way off base. Oh I understand the term, all right, and — I suspect — the reasons for using it as well. First, I want to say that commiserate and sympathize with your thoughts and feelings on realizing that Lowe’s ancestor was involved in the battle in which you lost an ancestor. I didn’t comment previously, as I recognized that you were writing about your emotions when you viewed the show. My comments here in no way are meant to diminish your loss. I wish their was a way to thank your non-direct ancestor for his service. I am a member of the DAR. Proving my descent from John Mangum, my Patriot ancestor, was not without obstacles as facts about my direct ancestor, Jane Mangum, the “Real Daughter” have been incorrect, in fact, just flat out wrong. This wrong information was published in an accepted work many years ago and is still being repeated, ad nauseum. The DAR does a great deal to support our troops. The DAR also supports schools in areas in which educational opportunities would not otherwise be available. Additionally, the DAR promotes Patriotism via Scholarships and Essay contests for students in Primary and Secondary education. Trust me, there are schools who limit their classes of American History at the Secondary level. Many universities do not require their students take American History. I find that a huge insult to our Patriot ancestors. Reading “Angry Mobs and Founding Fathers” by Michael E. Newton, made me realize that the Revolutionary war was a deeply complex event. Most Americans were neutral because, then as now, most people only wanted to work and live their lives in peace. People often switched sides from Loyalist to Patriot and vice versa. Families were often divided, some Loyalist, e.g., William Franklin, and some Patriot, e.g. Benjamin Franklin. It is said that my Patriot ancestor may have escaped his capture by Bloody Bill Cunningham alive because of the possibility that an uncle of John Mangum was a Loyalist. Though this is doubtful as ties to family and friends never really slowed down Cunningham any other time. Regarding Rob Lowe’s ancestor, as I understand it, he was a Hessian who stayed in America after being imprisoned, subsequently paying a tax which supported the Revolutionary war. I am not familiar with the specific tax, but I presume that there was a way not to pay the tax in order for the paying of the tax to qualify as “service”. Even if that was not the case, I presume that his ancestor could have pulled up stakes and left to avoid paying the tax. I presume there were those who did just that when faced with such a tax. Regardless, the DAR has said that paying this tax qualifies an ancestor as a Patriot and they don’t bend the rules to exclude anymore than they can bend the rules to include. I have no doubt that both DAR and SAR do many good works. One of many reasons why this whole thing has me so very conflicted. This has been a very interesting discussion spanning several blogs! Thank you for being willing to put your emotions out there for everyone to learn from and talk about. I definitely am not that brave! The push and pull between DAR as a membership based society and a keeper of genealogies has been an ongoing struggle for the last couple of decades. Really, it is for membership purposes but the requirement of lineage give it a very personal (and emotional at times) connection. Above all else, they need members to survive which has led to certain standards. I think the comment of a previous poster really hit the mark in that accepting supplementals on collateral ancestors would go a long way in documenting those that died during the war or whose lineage has died out. There were two collateral ancestors of mine, brothers, that were at Valley Forge and the Battle of Trenton. One was a member of Washington’s Guard. They both survived. One is an established patriot of DAR, the other is not. For me, I view history for history’s sake as I find the facts that surround their involvement interesting. Placing the norms and values of today on events of the past creates a bias in research. This is why I enjoyed Rob Lowe’s episode as they stated all the facts about the individual even though he really wanted a Rev War ancestor. The episode showed that sometimes we all have to face surprising facts about the ancestors. I absolutely agree with you (and Cathy, whose original comment raised this issue): it would be wonderful to be able to document the collaterals. I know of other lineage societies that allow that. So I just couldn’t get this out of my head and I wrote a letter to the NSDAR President General on my blog. There was an attempt to allow collateral lines years ago and it was denied because the argument was for allowing collaterals for original membership applications. Many things have happened since then where it might be better received this time. Good for you, Heather! That’s a change I could certainly support. Signed my letter today and sending it through the mail tomorrow! I’m sorry, but it seems to me that the word “patriot” has gone the way of the word “hero.” In other words, it has lost any real meaning as it continues to be applied to anyone for anything (well, just about). Human nature being what it is, we would prefer to find our ancestors worthy of pride rather than an embarrassment. For instance, we need to think about who this soldier was aiming at during the Battle of Trenton and prior battles. AS for me, I like to call a spade a spade–I have a few ancestors in my past I would prefer to forget. However, I can certainly respect the necessity to be wily and cunning to survive this country and prosper. That much I can grant them, and admit that I would probably resort to similar tactics under the same circumstances. But let’s be honest here–a younger son from Europe had nothing to go back to, chose to remain because he stood a better chance of a better life, and at most could be called a good citizen for making a contribution to the war effort via a tax. (Not even an unsolicited donation, mind you.) That is the extent of it. By the DAR definition in this case, many Americans at the time would qualify as eligible for membership. Do I admire him for taking a risk and throwing his lot in with a country still in the making, and of course, he was not familiar with the language or the customs. Yes, as I admire all immigrants. Was he a patriot? No more or less than his fellow citizens of that time. I suspect that it’s precisely in order to have folks qualify that the definition of Patriot is so broad.